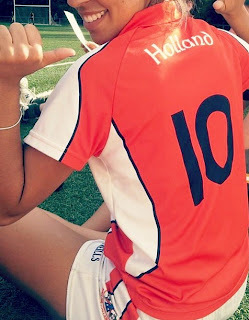 The Holland Ladies Camogie Team attended their 2nd tournament of the year on the 3rd of August in Brussels where they earned their first ever European Camogie title! Following a solid performance at the Luxembourg tournament in June which saw the girls achieve 3rd place, the team were determined to better that result and bring home the cup. The tournament was contested by 3 strong teams, Belgium, Luxembourg (combined with some Paris ladies) and Holland. 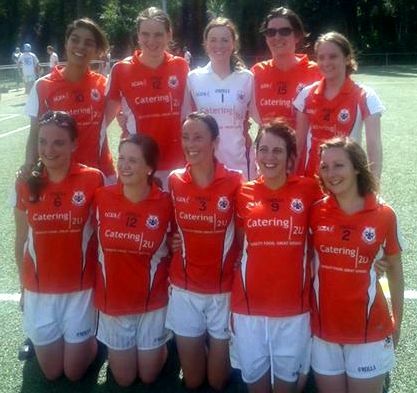 Temperatures of up to 28C made it a tough day to play Camogie but our girls proved ready for the challenge. The first game was against the home team who fielded 9 experienced players. Thanks to the accuracy of Niamh Richardson from both placed balls and from play, and to the solid performance in goal from Mairead Cleary who made multiple fine saves, Holland Ladies came out the victors by 0-8 to 1-3. The next game against Luxembourg was an even tougher contest. Luxembourg started well and got on top with 2 first half goals, going in at the break up by 6 points. Battling performances from Sarah Kenny and Nyala Noe in defence held out the Luxembourg forwards in the second half and goals from Niamh Richardson and Rose Holland saw the Holland ladies overcome the deficit and win on a score line of 4-6 to 2-3. And so to the final against Belgium, a strong first half performance saw Holland go up 0-5 to 0-1 at half time. Belgium came out firing in the second half taking some early scores. However Aisling Murphy and Helen Whelan fought tremendously to close down the danger in midfield. Great combination work from the Holland forwards saw Maebh Flanagan and Cyrielle Messabis assist newcomer Philippa Lynch score the goal of the day, a ground shot/bullet from 20m from goal. Belgium continued to apply pressure and this paid off with them netting a goal to bring the score difference to just 2 points. Rose Holland returned with a goal for Holland and Niamh Richardson with yet another point from play to ensure the title went to the team in orange. Final score: Holland Ladies 2-6, Belgium 1-4. This was an outstanding performance and result from the Holland Ladies who are only in their second year of existence, with the majority of the girls only taking to the sport this year. Great credit is due to the girls for their commitment and enthusiasm at practice for the past 6 months, and also to our coach, Jack O’Gorman for his training and patience! Full team: Mairead Cleary, Nyala Noe, Rose Holland, Sarah Kenny, Niamh Richardson, Aisling Murphy, Helen Whelan, Maebh Flanagan, Philippa Lynch, Cyrielle Messabis. We are always looking for new recruits so drop us a mail if you’d like to join!